In addition to my local Capital District EV Drivers group members, we had about a dozen EV drivers come from other areas, 150+ miles away to attend our event. They said that they chose our event over closer events that were not as well promoted and attended as ours. I had registrants meet me 30 minutes prior to the start of the event at picturesque Cohoes Falls, where I sorted the cars by model and lined them up for the parade. The 30 car EV parade vehicles all had 'drive electric' window flags and the procession concluded 2 miles away by making a grand entrance to the event at the 11:00 am start time. New York State Congressman Paul Tonko made a surprise visit to he event, where he shook hands and made a short speech to the attendees. He said he supports alternate fuel vehicles and the necessary EV charging infrastructure in NY State. Nemer VW set a new E-Golf and a salesman for test drives, as well as Fuccillo Nissan with a new LEAF SL. Daniel and Maureen Hayes - white Tesla 85, Jim McGlynn - Honda Fit EV, Aaron Schildkraut - Tesla 85, John Ashcroft - P85, Jim Klafehn - 2014 Toyota RAV 4 EV, Karsten Barde - National Grid Representative, Joshua Beach - Monolith Solar Representative, George Ryan, Brian Smith. 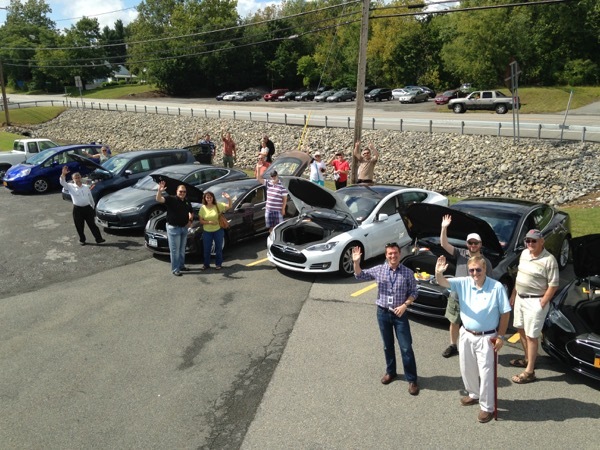 Take part in our Albany National Drive Electric week event at Guptill's Arena on the Latham/Cohoes border. 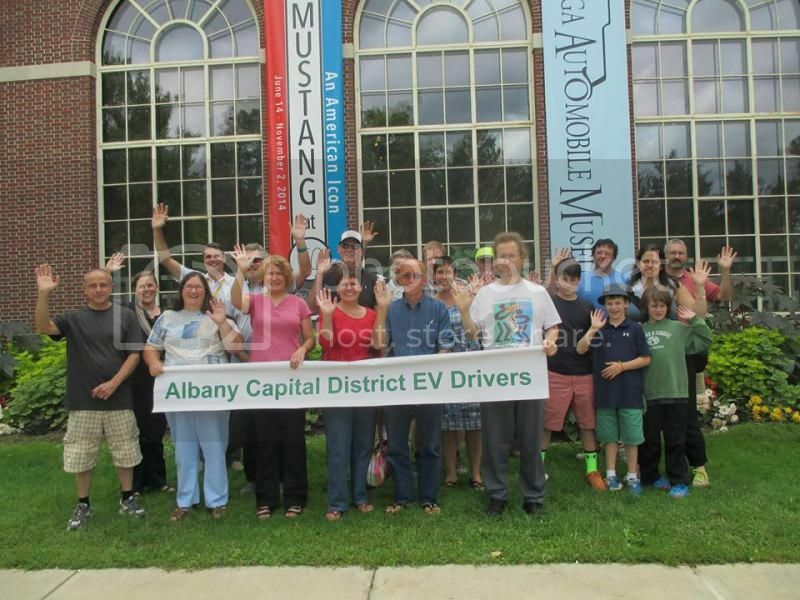 The Albany Capital District EV Driver's Group will be welcoming electric vehicle drivers and enthusiasts as part of their third annual National Drive Electric Week event. If you are curious about EVs, this event is your chance to not only ask questions to existing EV owners and see their personal cars, but also to test drive several different EVs back to back for comparison. We will meet at 10:30 am in the large parking lot at 240 N. Mohawk Street in Cohoes. We will then form a line and parade to the event location at Guptill's at 11:00 am. The famous Coney Express Ice cream stand will be open. EV car parade in the morning, followed by a group photo. There will be Solar power vender displays to show the advantages of making your own clean energy and saving money. If you are an EV owner and want to participate in the event we can use your help! Interested people are encouraged to join our Facebook group called the Albany Capital District EV Drivers. If you know of any EV drivers in the Albany Capital Region, please let them know about our group. Look for this banner on your way to the show. There are currently 225 attendees registered. Registered attendees report 687,717 electric miles driven.